Making money in the music business is simple. Anyone can do it, including you. ...you don't need to be a world-famous rock star to earn a lot of money. Learning basic money-making principles and applying them to everything you do in the music industry. Having other knowledge and skills outside of playing your instrument. This helps you add massive value to every project you work on and make it more successful. Having a strong work ethic, so you can take the right actions that are needed to build a lucrative career. Answer: Yes, many musicians do struggle financially…but not because making money in music is hard. Most musicians choose not to learn or do the simple things that make financial success possible. They might say they want to make more money, but their actions prove otherwise. This makes earning money in music even easier for you. Why? Because you have very little competition in the music business (yes, you read this correctly). If you are serious about your music career success, the size of your real competition is very, very small. You are a music business entrepreneur first, a musician second. You are in business of providing massive value to fans, bands, record companies, promoters, publishers, booking agents and other entities in the music business. “Providing value” means helping these people/companies get what they want. The more value you provide, the more money you earn. You have a lot more competition from other musicians who are just like you. People and companies in the music industry can find great musicians anywhere. There is no reason for them to work with you over anyone else (and pay you more money). You struggle to engage your fans, turn them into super fans and get them to support your music career. 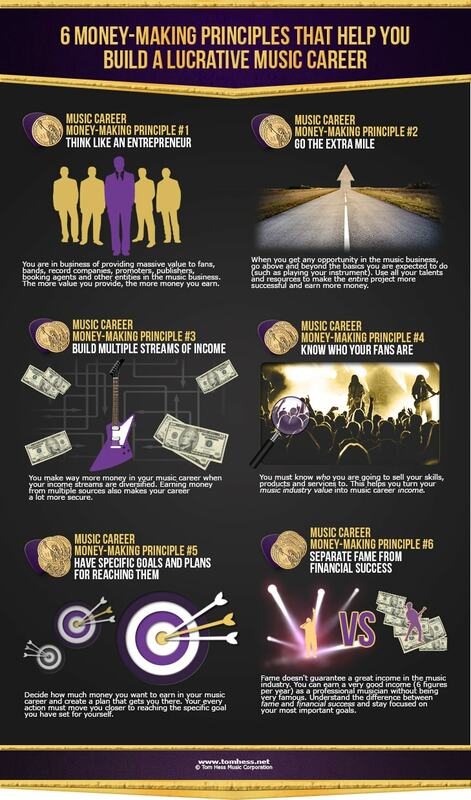 This guide explains how to think like a music business entrepreneur and get your fans to buy your music. When you get any opportunity in the music business, go above and beyond the basics you are expected to do (such as playing your instrument). Use all your talents and resources to make the entire project more successful and earn more money. Helping your band’s promoter book more shows. This makes their job easier and helps your band directly. Helping your band or record company reduce expenses (through some creative thinking) or find new streams of income. Do this even if you are not the band leader and don’t see an immediate increase in your own income. Thinking of new experiences to offer your fans that they want and are willing to pay for. This builds a stronger relationship with your fans and improves your cash flow situation directly. Looking for ways to improve your band’s merchandise sales. (Hint: most bands do a very poor job selling their merchandise. Anyone with any sales background can easily double or triple most bands’ income in this area.). Discovering the record company’s biggest problems and challenges and offer your expertise, contacts and knowledge to solve them. When you offer more value than anyone else, you become in demand. This means other people, bands and companies want to work with you. When you are in demand, the amount of money you earn goes way up. This is one of the best principles of free-market capitalism. In most cases, you are the direct beneficiary of your actions. When you help the project you work on make more money - YOU make more money! Use these free resources to prepare for a highly successful music career. 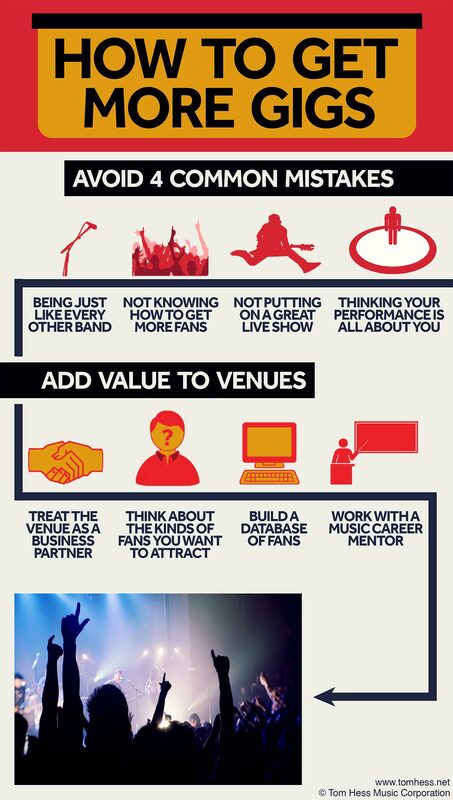 Learn how to grow your fanbase & make your gigs truly unforgettable. Your income becomes less secure. You are in big financial trouble if anything happens to your one source of income. You make way more money in your music career when your income streams are diversified. Earning money from multiple sources also makes your career a lot more secure. 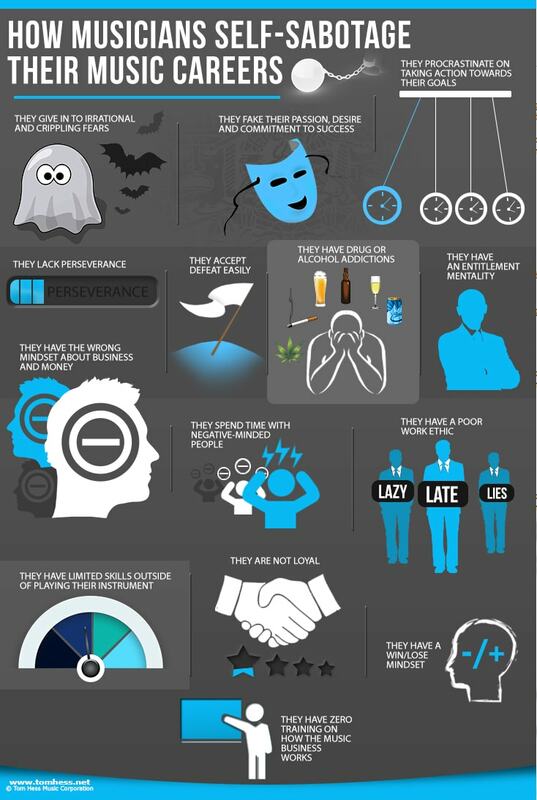 You must know who you are going to sell your skills, products and services to. This helps you turn your music industry value into music career income. If you are about to release your record, you must have a list of fans who you expect to buy it. You also need a way to easily contact your fans any time you want. If you are a studio musician, you need a list of studios, musicians and bands who may require your services in the future. If you are a performing musician, you need a list of clubs, booking agents and promoters to contact. You also need a database of local fans whom you want to come to your gigs. You also must build a relationship with your fans and make them excited about your upcoming release or show. This music career test helps you improve your music promotion skills. How much money do you want to earn every year in your music career? What streams of music-related income allow you to reach this goal? What actions must you take to put these streams into motion? Answers to these questions help outline your plan for financial success in your music career. Your every action must move you closer to reaching the specific goal you have set for yourself. Many musicians assume that being famous helps them make more money in the music industry. This is (usually) a myth. You can earn a very good income (6 figures per year) as a professional musician without being very famous. Fame doesn't guarantee a great income in the music industry. Many well-known musicians in big bands still work day jobs to pay the bills. Understanding the difference between fame and financial success helps you stay focused on your most important goals. Implement these principles to become a successful professional musician and earn a great living doing what you love. Want to make more money from selling your music? Download this free music career eGuide on how to get your fans to buy your music instead of downloading it illegally. Earn a good living in your music career by joining this music business training program.